Recipe Source Online: Welcome Fall With These Old Fashion Soup Recipes! There is just something about Fall that tends to bring out a desire for soup. Personally, I could eat soup everyday; it is one of my favorite things to eat. I went through some of my old recipes and thought I would offer some soup recipes you might not have in your current files. How about some Old German Green Bean Soup? Ham, green beans, potatoes, onion, and bacon are among the yummy ingredients. A totally different soup is the Hungarian Goulash Soup made with round steak and a tomato broth. Both are worth trying! Delicious. This recipe is older than my children and I am the grandmother of seven, one in college! 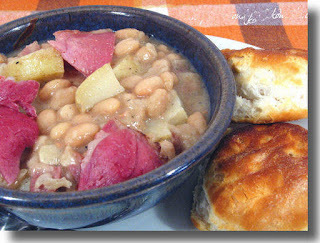 Place the ham and the ham bone with the beans, potatoes, water, salt, pepper, and garlic powder in a Dutch oven. Boil covered for half an hour or until the potatoes are tender. Meanwhile fry the bacon and onion together; add to the Dutch oven. Mix the flour with the milk until smooth and stir into the soup, stirring constantly while adding. Simmer, covered, for 15 minutes. Serves 6 to 8 people. In a large Dutch oven, melt the butter over medium-high heat. Add the beef and brown all sides. Using a slotted spoon, transfer to a plate; set aside. Add the onions and garlic to the Dutch oven and cook for 5 minutes. Add the beef back in along with the flour and paprika; cook, stirring constantly for about 3 minutes. Stir in the tomato paste until smooth. Add the chicken broth and water, tomatoes and the reserved tomato juice, potatoes, carrots, bay leaf, marjoram, caraway seeds, and pepper. Bring the mixture to a boil; reduce the heat to simmer and cook, stirring occasionally, until the beef is tender and the vegetables are cooked through, about 45 minutes. Remove the bay leaf. To serve, place into bowls and top with a dollop of the sour cream.